According to the National Oceanic and Atmospheric Administration (NOAA), flash flooding is most often caused by "extremely heavy rainfall from thunderstorms," though it can also be caused by mudslides, levee breaks, or dam breaks. Flash flooding is very dangerous and can occur anywhere, so it is critical to be mindful of risk factors that could trigger a flash flood, as well as to take steps to stay safe if one develops. 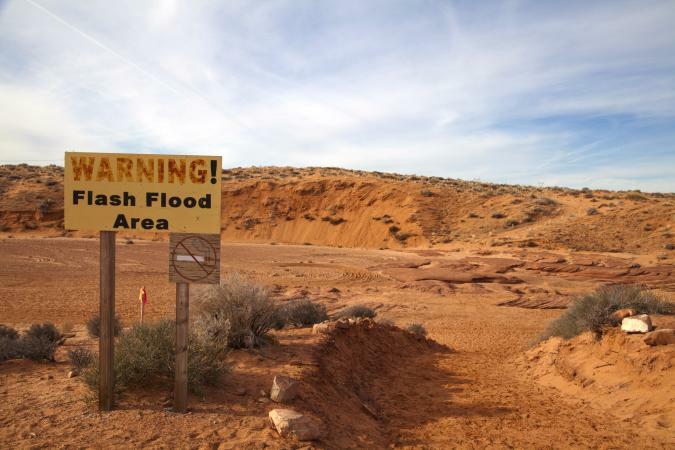 A flash flood typically occurs very quickly, often resulting in people being "caught off guard." There is not a lot of time to prepare for a flash flood, so anyone who lives in an area that is prone to experiencing this type of flooding needs to be educated about what to do should such conditions arise. NOAA indicates that flash flooding often begins within three to six hours of the triggering event, though these types of floods can develop and escalate in just a matter of minutes. Almanac.com cautions you should be particularly "aware of streams, drainage channels, canyons, and other areas known to flood suddenly." As they point out, "Flash floods can occur in these areas with or without such typical warnings as rain clouds or heavy rain." What Are Five Safety Rules You Should Practice During a Flood? Flood watches are issued by the National Weather Service (NWS) when "conditions are favorable for flooding." While a watch does not mean you will definitely experience a flood, it indicates there is a possibility of flooding - flash or otherwise. 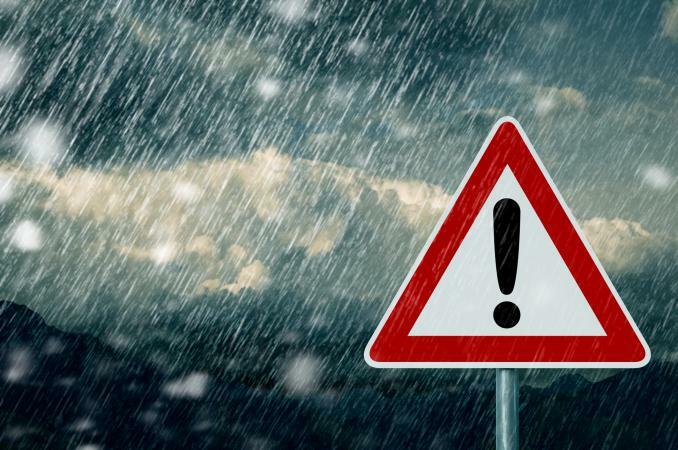 Closely monitor the forecast and weather conditions any time you are in an area where a watch is issued and begin taking steps to prepare to protect yourself, your loved ones, and your property should a flood occur. As the American Red Cross urges, you should "be prepared to evacuate at a moment's notice." Turn on a local radio or television channel, as updates about the weather situation will be announced periodically, as well as any instructions you should follow if emergency conditions develop. Additionally, if you have not already done so, enable severe weather alerts on your smartphone. Make a plan (or refresh your memory on your existing plan) for where you will go to reach higher ground if flooding conditions develop that make the location where you are unsafe. Also consider how you will get to that location, as driving may not be possible. Be sure you have a plan to get yourself and your loved ones to safety on foot, and (if necessary) at a moment's notice. 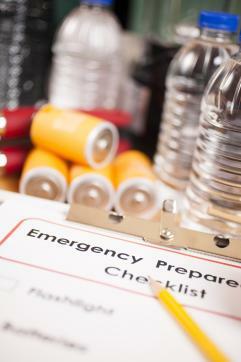 Verify that you have a fully-stocked and operational kit for emergency preparedness and make sure it is within easy reach in case you have to evacuate. At a minimum, this kit should include some cash, a working flashlight, fully charged batteries for the flashlight, and key first aid supplies. Almanac.com recommends stocking the kit with three days' worth of food and water, a week's worth of medicine, copies of important documents, a multi-tool, and a radio that runs on batteries or can be hand-cranked. Take steps to protect your property and belongings, such as bringing outdoor furniture inside and moving key indoor items to the highest level within your home, which may be a second floor or attic. Consider using sandbags as a barrier to redirect small amounts of water (up to two feet) and debris from flooding away from your house or other structures, advises the Federal Alliance for Safe Homes (FLASH). The NWS will issue a flash flood warning "when a flash flood is imminent or occurring." A flash flood warning is not always preceded by a watch because it is not always possible to know in advance flash flood conditions may develop. When a warning is issued, it is possible flash flooding has already started to occur. The NWS advises anyone who is in an area prone to experiencing floods to relocate to higher ground right away when a flash flood warning is issued. However, you should never go directly into flood waters in a vehicle or on foot. Ready.gov cautions, "Just 6 inches of moving water can knock you down and 2 feet of water can sweep your vehicle away." 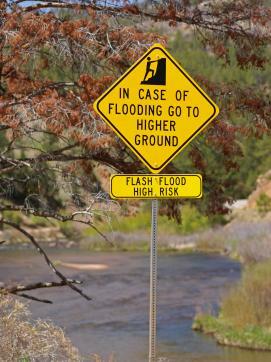 If you are in a low-lying area, immediately seek higher ground during flash flood warnings. It will be too late to leave if you wait until you see flooding begin. If you are on high ground, stay put. If a mandatory evacuation order is issued for your area, follow it immediately urges the Federal Emergency Management Agency (FEMA). Again, do not wait until you see signs of flooding because it may be too late to leave at that point. Popular Mechanics advises that you "kill the power and shut off the gas" immediately prior to evacuation. Never try to outrun a flood. If you encounter flood waters, "Turn Around, Don't Drown!" Despite your best efforts, you may find yourself being caught out in a flash flood. While it is ideal to avoid such a situation, you should be aware of what to do if it occurs. If you are in your vehicle during a flash flood, and it gets caught in water that is rising or stalls, the U.S. Scouting Service Project advises you should get out of it immediately. They reason for this is, as they explain, "rapidly rising water may engulf the vehicle and its occupants and sweep them away." If you are in a vehicle that is swept into rapidly moving flood waters, it is important to avoid panicking. They instruct, "Stay calm and wait for the vehicle to fill with water. Once the vehicle is full, the doors will be able to open. Hold your breath and swim to the surface." 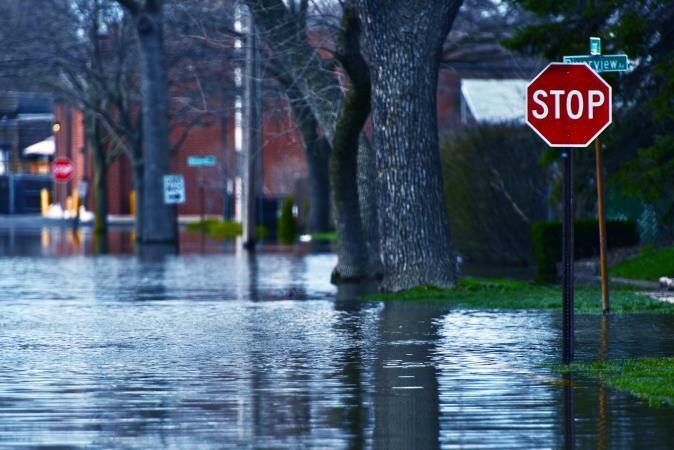 For situations in which you may get caught up on flood waters outside of your car, it's best to "point your feet downstream" and take care to avoid going beneath obstacles. Instead, you should navigate yourself over them. Should you find yourself stranded on a surface out of the reach of the flood waters (such as on top of a building or in a tree), you should stay where you are awaiting rescue. Do not, under any circumstances, enter the flood waters if you are out of their reach. Once the waters from a flash flood have receded, your first instinct may be to rush back to your home or business, but Ready.gov advises it is important to stay where you are until advised by local emergency management authorities that it is safe for you to leave and begin making your way back. Be extra-careful when approaching areas that have been covered by flood waters that have now receded because they may have experienced damage. Note damage from flood waters is not always easily visible. Roads, walkways, and other areas can experience significant erosion or otherwise be weakened by flood water. Continue to avoid trying to navigate through any areas where flood waters are still standing, whether by car or on foot. Find an alternate route or, if there is not one, stay where you are until the waters recede. Do not venture into standing water following a flood, even what may seem to be relatively small puddles. You have no way of knowing what kind of debris may be in the water, and it is very possible the water may have electrical current running through it. This is true whether you can see downed power lines or not, as many areas have underground power lines. Once you make it back to your property if you discover that it is damaged, be sure to take photographs before you begin attempting any clean-up or property recovery efforts. Having photographs of the immediate aftermath can be beneficial to you when you begin filing a claim with your insurance provider. Follow appropriate electrical safety precautions as you enter property where flood water has been or is present. The Nebraska Public Power District advises avoiding going into any structure unless you are fully certain that the power has been cut off. They emphasize, "Don't enter a room if you hear popping or buzzing, or if you see sparks." You also should not go into rooms where "water has reached the wall outlets" or if water is covering the plugged-in cord of any appliances. Take appropriate health and safety precautions for flood recovery as you begin the process of cleaning up any flood damage your property may have experienced, including being very watchful for downed power lines and tree limbs, as well as electrical boxes. If you are not sure whether or not your home or business is in an area that has a particularly high risk of being flooded, visit FloodSmart.gov. Here, you can view flood maps to find out if your property is in a high, moderate, low, or undetermined flooding risk area. You can also use the information in the maps to help decide on the best places to go if a flash flood threatens your home or business. Of course, it's important to realize that being in a low or moderate risk area does not mean you can't experience flash flooding, as these types of flood can occur anywhere - even in areas that are nowhere near a body of water. Draft an emergency plan that specifies steps to be taken in the event a flood emergency occurs. You may want to create a plan specific to flooding if you are in a particularly high risk area, or you may want to craft an overall weather emergency plan with a section focused on floods in addition to parts that discuss other types of weather emergencies. You can download a variety of helpful templates for this from the Make a Plan page on Ready.gov, including options for adults, children, commuters, and more. Each family member needs to be familiar with the plan and be provided with a copy of the document to keep in an easily accessible place. It should also be posted or stored in a central location within the home that any family member can access easily. The business plan should be communicated to employees, and they should have easy access to the written plan. Companies often provide these types of plans to employees in their safety handbook or other similar document. Having a flood emergency plan is important, but it is only the beginning. It's a good idea to periodically review it and hold practice drills to be sure that each member of the household (or staff member for a business) knows what to do in the event of such a situation. Depending on where you live and if you have a mortgage, you may be required to maintain flood insurance on your property. However, you may want to consider taking out this type of coverage even if it is not mandated in your particular situation because flood damage is not covered under homeowners insurance. Learn how flood insurance works so you can make a wise decision about this type of protection. Flash floods are a significant risk, no matter where you live. According to NOAA's National Severe Storms Laboratory (NSSL), "floods kill more people each year than tornadoes, hurricanes, or lightning" in the United States. Everyone needs to know the difference between a flash flood watch and a flash flood warning, and what to do in the event either is issued. Further, every household and business needs to have a solid plan in place ready to be implemented should an immediate risk or actual flash flooding occur.